My cousin Sarah was visiting and wanted to have a burger, a classic dish representing Americana. She lives in the U.K. Where they often go to Shake Shack that has an outpost (maybe several) in London, so not craving it, but still wanting to eat one in New York. She told us that she heard good things about Black Iron Burger, but, based on a previous disappointing experience there, I persuaded her to go 5 Napkin Burger, one of my top burger places in the city. There are several restaurants across Manhattan and I reserve a table at their location on the Upper East Side, conveniently located across from the new Second Avenue subway. The place is not much different from the others, the decor taking elements from a slaughterhouse. That day, I was really reasonable and skipped the milk shake I usually order there (they make a great cookies and cream one), and just went for their signature burger, the 5 Napkin, called this because it is so juicy one napkin will not be enough. This burger is composed of 10 oz. 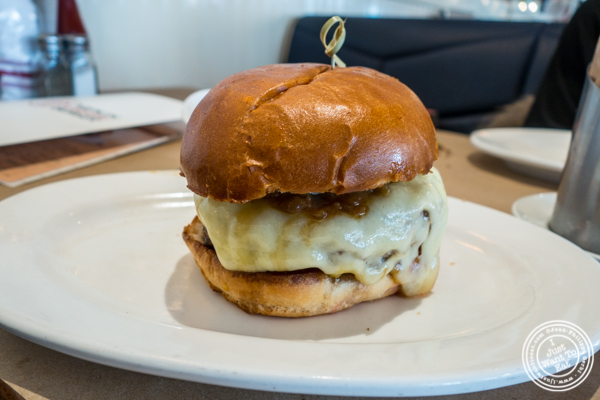 fresh ground chuck, gruyere cheese, caramelized onions and rosemary aioli on a soft white roll. It is thick and messy and you not only need a good grab but also to open your mouth wide open to take a bite. And what a bite! First of all, you really taste the meat and it is not overpowered by tons of spices. Then, the balance meat / roll is perfect. And on top of that, if you add the generous amount of cheese, the sublime aioli and the juiciness of the patty, you are in heaven. The only thing that surprised me is that now, fries come as a separate order, a good way to make people think that prices did not increase..,Well, they did: the $18 dollar burger served in the past can now be considered a $23 dish. I love Five Napkin Burger: their signature burger is for me one of the best in the City and I highly recommend it!